Germany, Israel and the United States signed an agreement Wednesday opening to researchers an archive of millions of Nazi files describing how the Holocaust was carried out. The accord was reached in April by the 11-nation governing body of the International Tracing Service, the arm of the International Committee of the Red Cross that oversees the archive in the western German town of Bad Arolsen. Britain and four other nations also signed the accord, and three others are expected to do so later. "Those who suffered from the Holocaust will welcome access to these archives as they hope to answer long-standing and agonizing questions about the fate of family members and family property," U.S. Ambassador William Timken Jr. said. The agreement broadens access to the files, which have been available only to Holocaust victims and some immediate family members. Under the provisions of a 1955 treaty, third parties only have been able to access the archives with the written consent of a victim. The protocol still needs to be ratified by most of the 11 signatory states before the archives can be opened. Aging Holocaust survivors and victims' families had pressed for the change, arguing that the histories of their loved ones could otherwise be lost. Germany had said that access to the files by Holocaust researchers would violate its privacy laws, but it dropped its objection earlier this year. German Deputy Foreign Minister Guenter Gloser called the process "long and sometimes cumbersome" but said the result represented a "big success for researchers." "For Germany, the signing underlines the importance it attaches to dealing with the past," he said. There is no concrete timeline on when access will be broadened to journalists and other researchers once the protocol is signed, but German Justice Minister Brigitte Zypries has said she hoped the process would be completed by Dec. 31. The Nazis were meticulous, documenting everything from the mundane, like how many meals a forced laborer received, to the horrific in describing a concentration camp prisoner's death in painstaking detail. 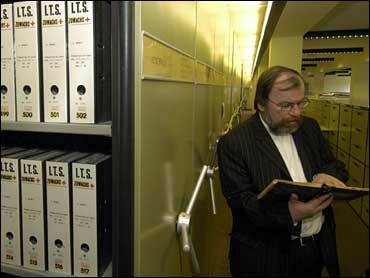 Much inside the cabinets is simple, solemn fact, such as a name on a concentration camp death list. Others of the archive's 30 million documents relate to mental illness, homosexuality, medical treatment and even the presence of head lice. The International Tracing Service was founded after World War II to trace missing persons. Later, survivors eligible for compensation applied to the archive for documentary evidence of their mistreatment.